"Would the extinction of honey bees lead directly to the extinction of humans?" That's a recent question posed on Quora, where folks can ask questions and receive answers. "We are a resilient species that existed before beekeeping and will exist after it… but our cuisine will be very different," wrote Matan Shelomi, a Harvard alumnus and UC Davis graduate student seeking his doctorate at the University of California, Davis. 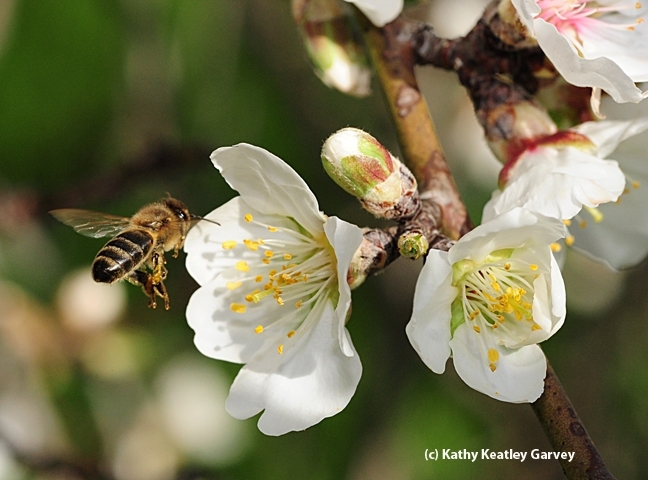 "Assuming native bees and other pollinators do not take over the job of the honey bee Apis mellifera, many of our favorite fruits and vegetables will cease to exist, or will require the very labor intensive manual pollination we see in parts of China," Shelomi noted. "Kiss almonds goodbye, for example. Staple crops like wheat, corn, and rice are not bee pollinated, however, so starvation won't be an issue." Shelomi, who has received international recognition for his answers on Quora, is "right on," said Extension apiculturist Eric Mussen of the UC Davis Department of Entomology and Nematology. Unfortunately, people are falsey quoting Albert Einstein as saying "If the bee disappears from the surface of the earth, man would have no more than four years to live.” Al Gore never invented the Internet, and Albert Einstein never said that about bees. Without honey bees, our menu choices would be much different. But would the human race become extinct? You have shared such an useful and valuable information through this post. Glad to read it. Would like to say thank you for sharing this with us. Keep sharing. Very great and nice blog. Nice information. Will bookmark this blog.